I think your right Jeff on conditions playing a big part in this. This could get costly getting a different kite for Chicago's weather. From reading about them, some are harder more sensitive and not good for a beginner. Looks like the rev exp, rev 1 or 1.5 are the way to go. I went to the rev links for purchase, the 2 stores in IL, no luck, one a non professional VM and the other a fast busy, leaving me to guess they are no longer around. Any recommendations on a place to purchase from? too bad you couldn't make it out today. We'll catch you yet. I would strongly recommend a Rev 1.5 rather than a Rev I. Most everyone flies a 1.5, there aren't many Rev I's flown anymore. Flying a 1.5 will let you play with the other Rev fliers more easily. The EXP, SLE and B-Series all are the same size and are all basically 1.5s. The standard SLE has a large diameter tube in it's leading edge and is probably not the best way to start. The EXP is a good, relatively inexpensive way to start with Revs and has a good wind range. It comes with 3 wrap spars. The SUL, is a lightweight 1.5 and is great for days like today. It comes with 2 wrap spars. The B-Series is a great package. It's a 1.5 sail that comes with two sets of spars: 2 wrap and 3 wrap. With it's lightweight spars you can fly it in light winds like the SUL, with it's stiffer spars you can fly it in stronger winds. Eventually, when the winds pick up in the fall, you'll want a vented kite. They are good not only for strong winds, but they are also great in lower winds for precise control. Most of the top fliers fly with vented kites when they can. They just put those 2-wrap or 3-wrap spars in there. The standard Vented 1.5 comes with a thick spar that you almost never need, if ever. You can order it with a 4 wrap spar which is better. The B-Series Vented come with 3 wrap and 4 wrap spars. A duplication of spars if you bought the standard B-series. Just to confuse things a little more, you can also order a set of spars separately. At the top of this page is a small banner ad for Chicago Kite. David Zavell sponsors our website and is who you should call first. He has good prices and should be able to get whatever you need. After you muddled things over in your mind a bit, write back to us and tell us what you're thinking and we'll help you out. Here's my personal recommendations based on my experience and pocketbook considerations. I'm sure Mike and Chris will chime in here..
3) 1.5 SLE or B-Series Vented. It's all you really need. In fact, if you can handle a Rev without smashing it into the ground, the SUL and Vented may be all that you ever need. 1) 1.5 SUL - Great all around, low wind kite. Rev recommends < 8mph winds (I believe). We fly ours in heavier winds... most of the time, you can use the SUL up to the point of flying a vented. Myself, I prefer to only use the SUL in the lightest winds per Rev recommendations. But that's just me. 2) 90% of my flying is with the Standard B-Series. Because it comes with 2 frames (2 wrap and 3 wrap), it will handle most everything we experience here in the Chicago area until you get to 10+ mph winds. It's fast, crisp and great fun to fly. Very similar to the 1.5 SLE other than price and accessories. Considering that you get handles/2 frames, etc, the price, while close to $300, is a great deal. If you do decide to go with a 1.5 SLE though, be sure to request it with the 1/4" frameset. If you need more information, please ask..
3) on occasional days, +10mph winds are handled incredibly well by a vented. 10 is my low end with a 2 wrap frame but when we do get those higher wind speed days, there is nothing better than the vented for precision and control and fun. If it were me, and I was sure that I was going to take flying seriously, and I could afford it, I would get the Standard B-Series to start with. If money is the issue, then the SUL is the way to go. I will caution you on light wind flying though. Just because you get a SUL does not mean that flying in light wind is going to be effortless and easy. Light winds are tricky and typically involve lulls of no wind and shifting wind. Light wind flying is also a learned art form. Experience in normal winds is what will help you in the light winds. I will also say that you will have to have patience and a resolve to learn to fly. Please feel free to use us and our experience to help you along. Flying with us or someone else experienced will help you grasp the basics quickly and hopefully prevent any frustration that would make you want to stop. It covers a wide wind range; 3-20 mph and comes with two spar sets, a 2 wrap and 3 wrap. Call David and let him know what you want, he can get any color combo Rev offers, even if he dosen't carry it in stock. Babbman wrote: Flying with us or someone else experienced will help you grasp the basics quickly and hopefully prevent any frustration that would make you want to stop. I've found it to be invaluable to spend time flying with the experienced fliers here. You will not only learn how to fly, but learn about the kites, the different models, the conditions, etc. I've been sucking up the knowledge all season, and only just recently felt that I knew enough to know what I wanted. Earlier in the year, I couldn't have told you the difference between most of the kites. Also, Tom showing off some mad dualie skills! Last edited by chicagokite on Mon, Jul 23 2007, 08:53 PM, edited 1 time in total. The only other thing I could add, is hold off ordering anything till after the picnic, if you can make it. We would be willing to let you try the different ones out. That is of course depending on how nice Mother Nature is to us. That way you can test fly any and all the above mentioned. The picnic is on the 12th of Aug. and will be at Perry Farms in Kankakee. yes im up here with planes this week but will be available pms or email. WOW! Thank you all for so much information and the replies! It really does help narrow it down. Leaning towards the 1.5, but not sure which one yet. When I get some sleep, then I'll come back and reread all of this. I can't make it to Perry on 8/12. It was the only weekend I could get a cabin in WI to conincide to go rafting with my daughter. My heart sank when I heard that was the only weekend that would work with my days off. PMSing, cute Chris. Pass that stage, now in the F,F&F stage, you've been warned. I think I have this narrowed down, but if I'm wrong, PLEASE LET ME KNOW! I need 2 kites, light and heavier winds. Thanks so much for everyones help. Roxy wrote: UGGHHHH, the decisions. Right on with the SUL. You will get a 2 wrap frameset with it. With that combination, you can drop the 2 wrap set from your SUL into the vented to get down even further on the wind speed. A hint on ordering.... spec out what you want. Don't settle for in stock if there is a color combination you really want on the SUL. Remember, you have to look at it all the time... make yourself happy. On the vented, think bright.... I have the Blue/Black B-Series and while I like it, it is pretty dark in the sky. The Gold (mango?) or lime look great and there are some other colors available. I've seen pink, purple and Red also. If you are buying these at the same time, do this..
get the SUL as 'kite only'. You will save almost $60 this way. You will get a set of handles with the b-series vented as part of the package that will be fine for everything you fly. Plus, you cannot get the B-Series as kite only yet. Also, on lines... we use 75' x 90# on the short side and 120' x 90# for team flying. Of course, there is everything else in between. 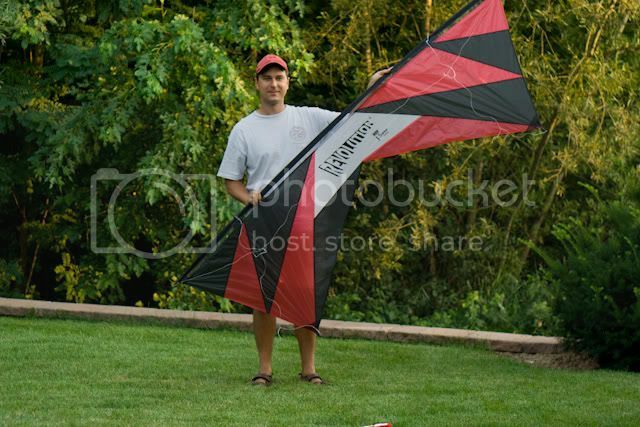 Many people are very comfortable with 85' x 90#... You will need to order these with the kite. you got it, this is all you need. I'm very flexible about colors myself and usually take what's in stock. And I like the blue-black B-series kite. Though Red/Black/White are the club colors and the way my kites are tending to go now. Eventually, next year, you'll want 120' lines. Right now, you can borrow a set from me whenever you want to fly with a group of us. I'm jealous Jeff, it's beautiful. I think I finally have my order together, just pricing it out. Is 13" handles the better way to go? I'm 5'9, not petite. I should get around to posting a picture of me on here. Getting the 1.5 SUL, 1.5 SLE bressler (spelling?) vented B with # 3 & 4 wraps. I just hope I get it off the ground. Roxy wrote: I'm jealous Jeff, it's beautiful. The handles on the Barresi are 13's I believe. Regardless, they are superb for flying all the 1.5's and have a knot system built in that makes it easy to adjust to your liking. Feel free to beat David into submission and make him give you a good price for the complete package. With Revs, the handle size isn't related to the flier's size. It's more related to the size of the kite and personal preference. The handles that come in the B-Series package are the way to go.